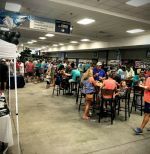 Thursday, June 27th, 6-9pm: The Lowcountry Open and Budweiser will be co-hosting the Palmetto Kingfish Tour Kickoff Party at Johnson Hagood Stadium (68 Hagood Ave, Charleston, SC) for all Kingfish Tour entrants. Festivities will include complimentary food, drinks, door prizes, raffles, auction items and live entertainment. The Captain’s Party will allow the Tour director to address all participants regarding rules, procedures, scoring and answer any questions. Power-up levels 2 and/or 3 for the Tour can be added to your team profile until 8pm.